BNL’s Kiara Terry smacks a forehand return during action at No.1 singles. Terry posted a win, but the Stars fell 3-2 to Vincennes Lincoln on Thursday afternoon. BEDFORD – Decisions, decisions, decisions. Hey, that’s why coaches make the big money. Well, perhaps not high school coaches. Nevertheless, Bedford North Lawrence’s Joni Stigall will be making some tough lineup choices after the Stars fell to Vincennes Lincoln 3-2 in their home debut on Thursday. 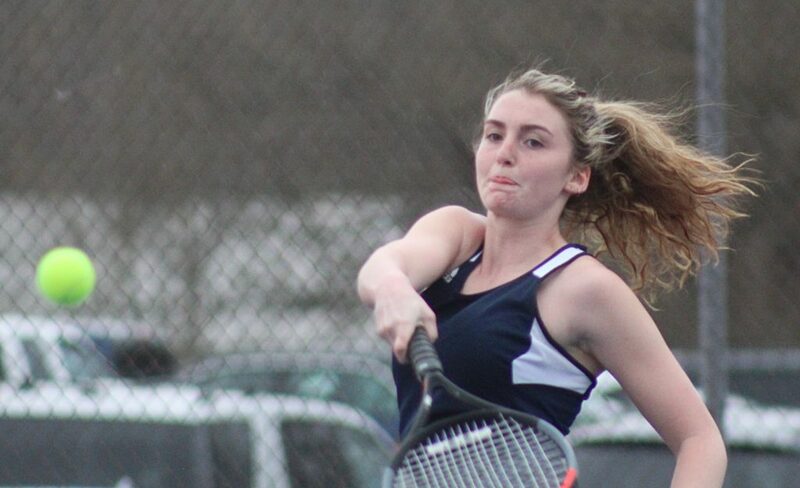 The Alices pulled out a victory at No.1 doubles for the deciding point, and Stigall felt some lineup adjustments were necessary as the Stars slipped to 0-2. The shuffling might come lower in the lineup. Kiara Terry looked solid at No.1 singles as she stopped Anna Purdom 6-2, 6-3. BNL’s other win came from Abbey Bridges and Molly Simmerman at No.2 doubles as that duo conquered Katie Roman and Abi Kirk 6-3, 6-4. Lincoln recorded wins at No.2 singles (Alison Hein dropped Presley Clark 6-2, 6-1) and No.3 singles (Savannah Purdom pounced on Alex Godsey 6-3, 6-1). The team result swung on No.1 doubles as Kaylee McKnight an Ashlyn Hillenbrand edged Abby Riley and Sarah Gaither 6-3, 6-4. BNL will return to action on Monday when it hosts Bloomington North.